Instead, we get a true to Muppet form movie as our favorite creatures set out on a multi continent tour full of shows, burglaries, and jewel heists. A theme that has been done before with the Muppets. But at least the Muppets are self aware that sequels are never quite as good as the original as they sing in their opening song called ‘We’re Doing A Sequel’. But this sequel is not all fun and games at all, as we start out exactly where we left off on the first film right outside the theater in Los Angeles, where the Muppets have dinner with a high-powered manager named Dominic Badguy (Ricky Gervais), who encourages them to go on a world tour with their show. Little do the Muppets know that Dominic is an actual bad guy who is planning on robbing priceless works of art and jewels from each place the Muppets play at in hopes of taking over the world as the planet’s number one criminal. But he can’t do it alone. He needs the help of Constantine, the world’s most dangerous frog, who is a Russian ninja complete with an accent and mole and looks exactly like Kermit. It’s funny, because in light of recent events in the actual news, this Russian bad frog is quite a coincidence. 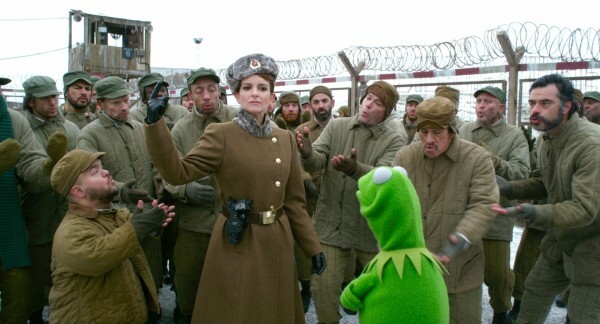 Once Constantine breaks out of a Siberian prison run by Nadya (Tina Fey), he switches places with Kermit, as Kermit is transferred back to the Siberian prison full of bad guys. While Constantine and Badguy are robbing art galleries and banks, Kermit is trying to survive prison life, but luckily for him, Nadya loves musical theatre and wants to put on a great performance for the annual prison talent show. And Kermit is just the frog to make it happen. Meanwhile, it seems nobody realizes that Constantine is actually Constantine, but rather Kermit with a col, due to his thick Russian accent. He even woos Miss Piggy into marriage within 48 hours which is to take place in London, the same place he plans to rob a precious piece of history and blow everyone up after the job is done. Even new guy Walter doesn’t see through Constantine at first. Instead Animal is the only one who knows the real Kermit. 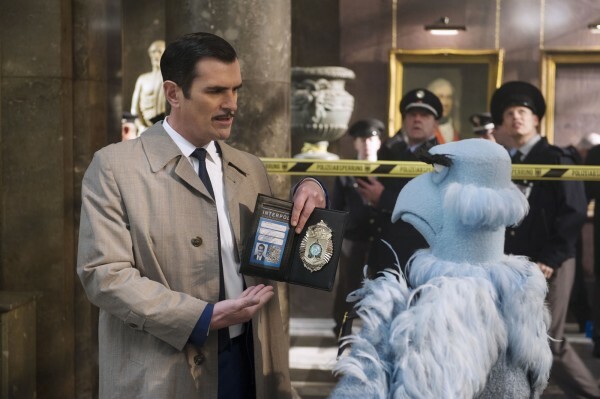 Ty Burrell plays a version of Inspector Clouseau, searching for clues to the serial robberies, which gets several laughs. There are several references to other films such as ‘The Sound of Music‘, a full number from the play ‘A Chorus Line‘, and even ‘The Seventh Seal‘. And the music by ‘The Flight of the Conchords‘ this time around isn’t as great as the first one, but it does have some good moments with some catchy tunes. In fact, there is one number that is sure to get big applause from older fans. And returning director James Bobin along with his co-writer Nicholas Stoller must be big fans of Mel Brooks, because there are some silly scenes that play during the film similar to something Mel Brooks would have done including a bunch of rough and tough prison inmates who break out into song and dance Broadway style. The lights are not out on the Muppets by any means. There are plenty of laughs for all ages and some fun over-the-top performances. And the cameos keep coming including Celine Dion, Christoph Waltz, Ray Liotta, Danny Trejo, Frank Langella, Salma Hayak, Tom Hiddleston, Puff Daddy, Chloe Grace Moretz, and Zach Galifianakis to name a few. ‘Muppets: Most Wanted’ is quite fun, but I don’t think it has a replay factor like the last one did. ‘Muppets Most Wanted’ comes with an impressive 1080p HD transfer and is presented in 1.78:1 aspect ratio. 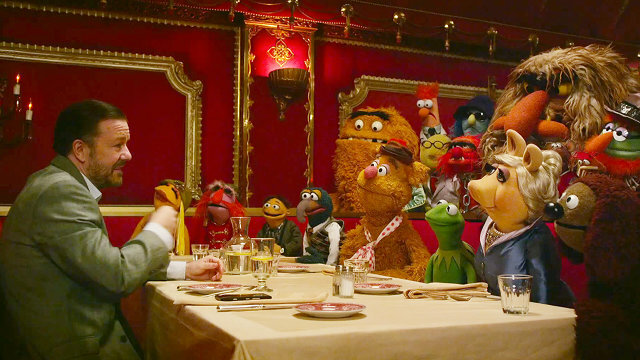 Just like the first ‘Muppets’ movie with Jason Segel, this sequel is quite demo worthy and full of life. The image is simply spectacular. The detail is very sharp and vivd. You will be able to make out individual feathers, hairs, fur, and felt on every muppet with ease. There is a lot of image depth to this film. The colors are bright and vibrant throughout and simply pop off screen. From Kermit’s light green skin Gonzo’s blue and every color in between, it all looks magnificent. Black levels are always deep and inky and skin tones on the human actors always look very natural. There were no instances of any banding, aliasing, or video noise, giving this video presentation top marks. This release also comes with a DTS-HD 7.1 High Resolution audio mix rather than a Master Audio mix, which is quite odd, considering the previous film had the Master track on it. Now what’s the difference between the two? This High Resolution mix basically doesn’t pack the big punch like a Master Audio can. While this still has some great moments of sound, it never hits the high note. Dialogue is a tad bit softer and sound effects and ambient noises don’t come through quite as well. More so, this High Res mix is more front heavy than I’d like it to be. That being said, dialogue is always crystal clear and easy to understand and free of any pops, cracks, or hissing. The LFE is quite good with a very wide dynamic range. The songs and score all sound robust and full as well. But if you compare the previous film with this one in terms of sound, you’ll find that the last movie sounds a bit better. Unnecessarily Extended Edition (HD, 119 mins.) – So you’ll notice that there are three different version of the film. There is the original theatrical cut, which is the one you saw in theaters, and there is this Extended cut, which is about twelve minutes longer. There are some more cameos, jokes, and extended scenes. I could say they didn’t add anything to the picture, but then that would be saying less muppets the better, which is not true. The Longer Longest Blooper Reel in Muppets History (HD, 10 mins.) – Here are ten minutes of actors and the muppets laughing, missing cues, flubbed dialogue, and more. It’s quite funny, but ten minutes seems a bit much. Rizzo’s Biggest Fan (HD, 3 mins.) – This bonus feature made me laugh. Rizzo the rat’s biggest fan, writes to the movie execs his anger and how upset he is that Rizzo was not in the film. Statler and Waldorf Cut (HD, 2 mins.) – Remember how I said above that there are three different versions of the film? Well this is the third version of the movie, which is all of two minutes long. Everyone’s favorite elderly and grumpy men show us how good of a movie this could have been if it were only two minutes long. Music Video (HD, 3 mins.) – Bret McKenzie from ‘Flight of the Conchords’ performs ‘I’ll Get You What You Need’. ‘Muppets Most Wanted’ was a very good sequel, but it wasn’t as good as the previous film, maybe because there just wasn’t the energy that the last movie had. That being said, this still has tons of moments where I laughed and sang along, and of course it is always great to see the Muppets in a new adventure. The video is demo worthy and the audio is very good, but a little lackluster. The extras were fun, but I wish there were more behind the scenes type of extras. 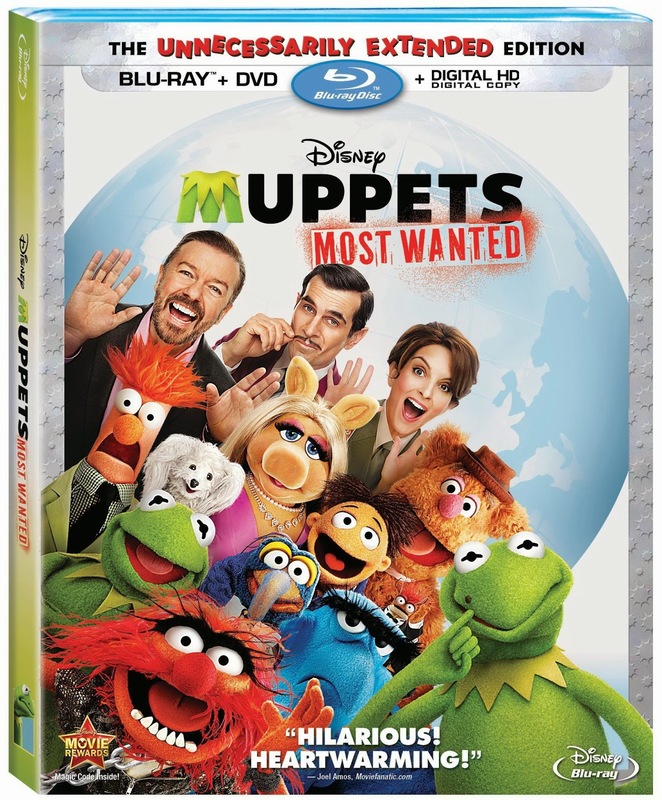 In all, this release comes highly recommended still, because hey, it’s the Muppets. This entry was posted on Thursday, August 14th, 2014 at 11:12 am	and is filed under Film, News. You can follow any responses to this entry through the RSS 2.0 feed. You can skip to the end and leave a response. Pinging is currently not allowed. « Jack Huston Joins Lily James in ‘Pride and Prejudice and Zombies’!! !